Gluten Free & Allergy Friendly: #UdisBacktoSchool Lunch Ideas & Giveaway! 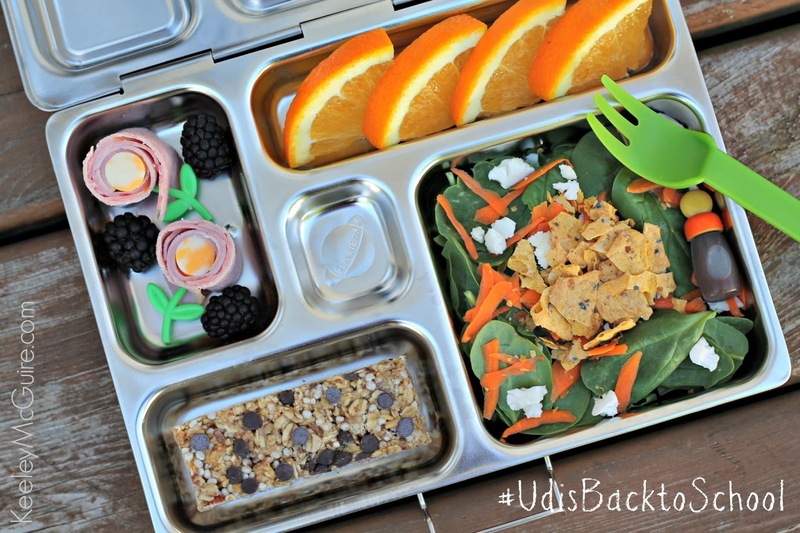 #UdisBacktoSchool Lunch Ideas & Giveaway! We started using Udi's Gluten Free products over three years ago when we had to remove gluten from Little Miss' diet. Since then, we've been packing their delicious goods in our work and school lunches and sharing those ideas here on the blog and through social media. 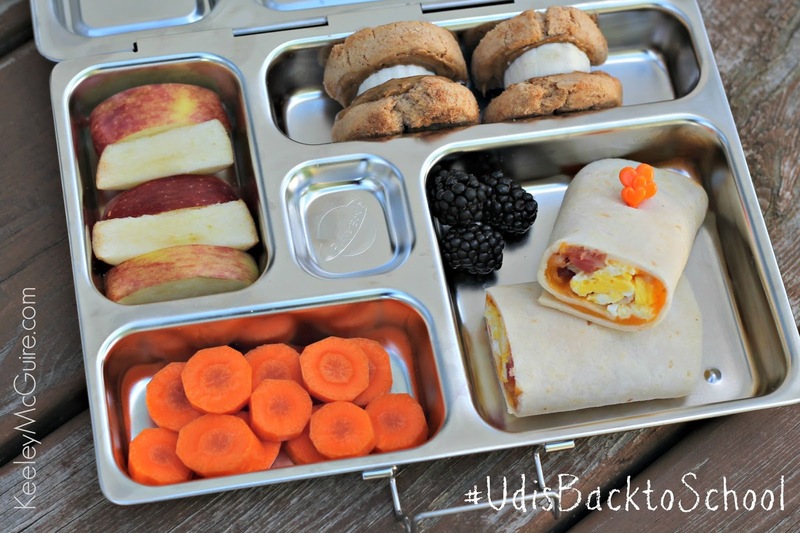 We want your family to be able to pack great lunches too. That's why Udi's has partnered with us to bring you an amazing back-to-school lunch giveaway! The family of products Udi's offers is constantly growing and we love sharing great ways to incorporate their products to give everyone fresh ideas! One of my favorite breads Udi's sells is the Omega Flax & Fiber Bread. It's gluten, nut, dairy, and soy free. I love the blend of Omegas, protein, and anti-oxidants in each slice. Here we've packed one of my go-to sandwiches: Sunflower seed spread with honey and apple slices. I love the added crunch from the thinly sliced apples inside the sandwich and sweetness of the honey. Packed along side are oranges, blackberries, cauliflower, zucchini slices, and two (gluten, soy, & nut free) Dark Chocolate Brownie Bites by Udi's. Some days, you and your kiddos just don't want "another sandwich". Another reason why we love the Soft Plain Tortillas by Udi's. They're gluten, dairy, nut, and soy free. They make delicious quesadillas or how we've packed them here as a breakfast burrito! Who says you can't have breakfast for lunch?! 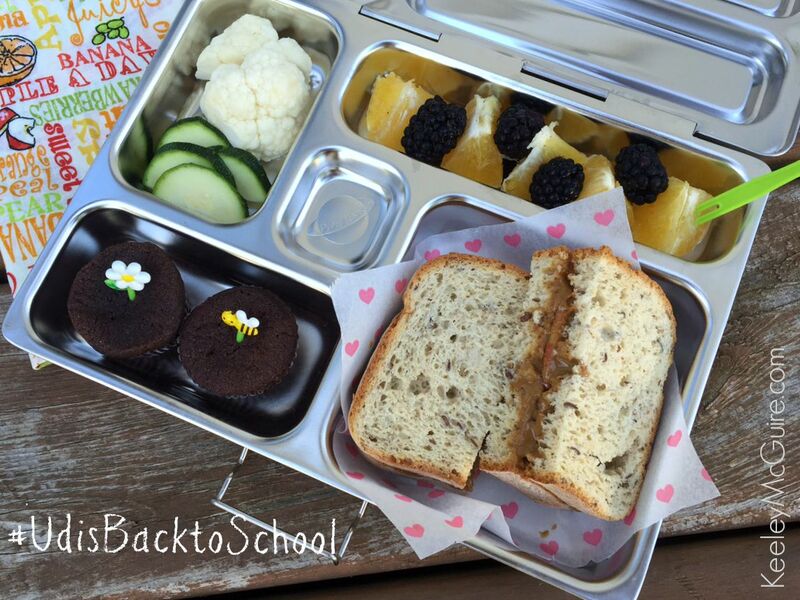 Packed along side are a couple blackberries, apple slices, carrot coins, and two "Snickerdoodle Sandwiches". The sandwiches are made from two Udi's Snickerdoodle Cookies cut in half. Then filled with sunflower seed spread and banana slices. The cookies are gluten, soy, and nut free. Tip: Keep your apples and banana slices from browning by soaking them in a juice like pineapple, orange, or lemon. We use apple juice for our apple slices. Let them soak a few minutes then pat dry before packing. I feel very fortunate that my Little Miss loves spinach. Oddly, she won't eat a iceberg lettuce salad but will gobble up one made from spinach. Silly girl! But I'll take it! We often make smoothies for breakfast with spinach blended in, but when we don't I like to pack her a salad or side salad for lunch instead. Here we've packed orange slices, blackberries, ham flower power roll-ups, and an Udi's Chocolate Chip Granola Bar. Little Miss can't have the bars since they have almonds and a peanut warning, but they are gluten free and rich with antioxidants! A great option for those also in need of more fiber sources in their diet. They also offer two additional yummy flavors. Speaking of nutrition sources, yogurt topped with Udi's Granola is a great way to pack a protein punch for lunch! The Au Naturel Granola has a hint of honey, 3g of protein, and is gluten, dairy, soy, and egg free (it has a tree nut warning). Pack it for lunch with fresh veggies, fruit like apples & blueberries, and half of an Udi's Whole Grain Bagel filled with cream cheese. It would also be delicious filled with sunflower seed spread or jam too! The bagel itself is gluten, dairy, soy, and nut free. 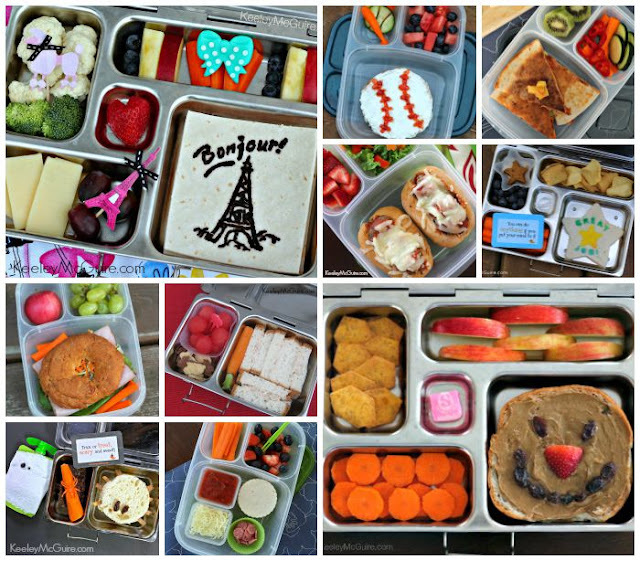 Need even more lunch box inspiration? 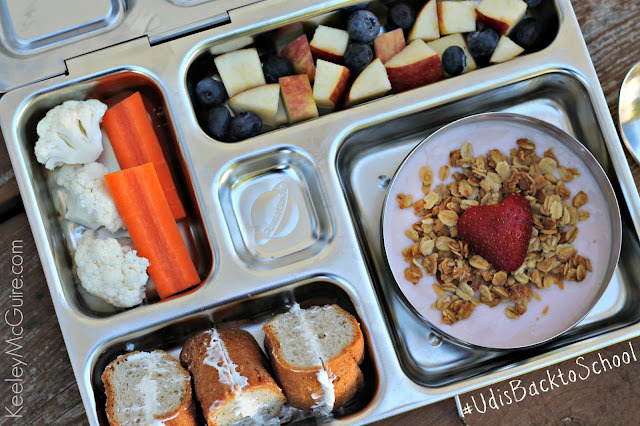 Scroll through our site for TONS of fun lunch ideas using Udi's Gluten Free products! You can help inspire too! 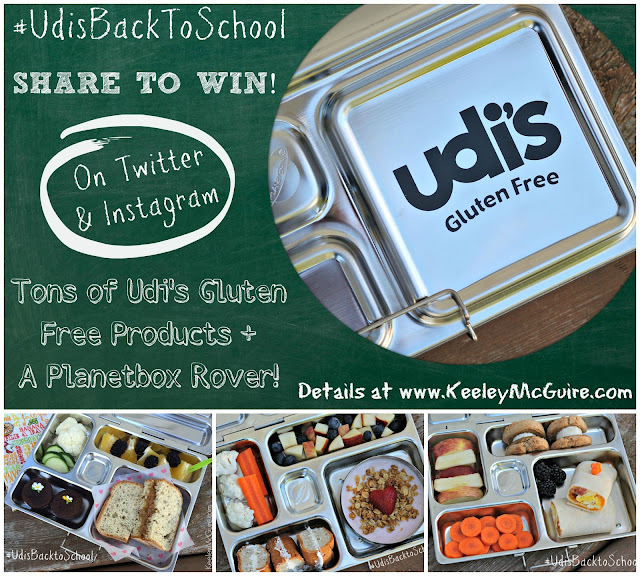 Share your lunch photos with Udi's Gluten Free and Keeley McGuire on Twitter & Instagram and enter for a chance to win a HUGE prize package courtesy of Udi's Gluten Free! How do I enter? All are welcome to enter through the Rafflecopter widget below. To get a FIVE POINT entry, SHARE your lunch photos via Twitter or Instagram. You can share a new post daily for five more entry points! 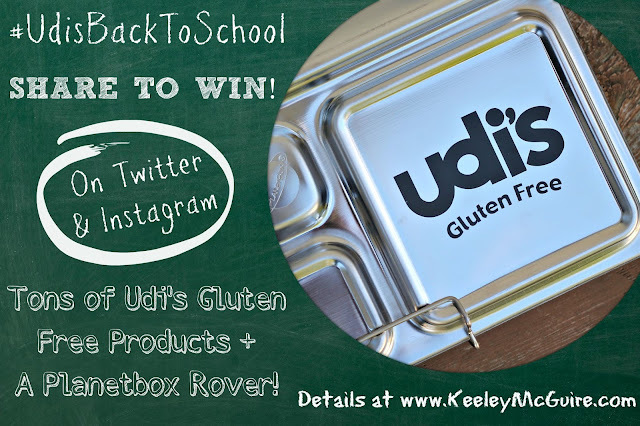 In order for the photo entry to count, you must TAG both Udi's Gluten Free and Keeley McGuire + use the hashtag #UdisBacktoSchool. Just let us know you did it via the Rafflecopter widget below! Again, you can enter the photo share daily for FIVE entry points each day! Woohoo! Giveaway ends Tuesday, September 8th @ 11:59pm EST. GOOD LUCK! We love Udi's! The white sandwich bread is a weekly staple in our house. I just discovered that they make tortillas recently, but I haven't been able to find them locally yet. I hope we can track some down, because we're excited to try them! Would love to win the Planetbox too...been wanting one of those for a long time! We like a lot of Udi's products, but my son's favorite is the chocolate brownie bites. I love the Udi's oatmeal raisin cookies but I haven't seen them for awhile. Not even sure they make them anymore. I love Udi's bagels and tortillas. Thanks. I'm newly gluten free and Udi's is one of my favorite brands to nom nom on. We love Udi's frozen Family meals, especially the Ziti & Meatballs! Everything bagels are my faaaavorite! Love Udi's bead. We stock up at Costco. Owen would love to have bagels in his lunch this year. I like the granola, in particular the Cranberry Granola. I can see I have been missing out! I've only eaten the bread and love it. We love their tortillas and pizza crust! I have three boys with numerous food sensitivities and nut allergies. School has always been difficult with all of the celebrations that they can't fully participate in. This year, I'm most excited that our district has gone food/treat free for celebrations! They're focusing more on health and wellness! I joined the Health Advisory Council and have been advocating for stronger awareness! :) We love the Udi products because they offer so much variety! We love the raisin cinnamon bread! YUM! We've used a few other breads too. I've always wanted to try their pizza crust and bagels. We love their brownies and muffins. My daughter would love to win the lunch kit! I really enjoy Udi's bagels! I would love the PlanetBox! My favorite back-to-school product by Udi's Gluten-Free is the Steak Burrito! Delicious! Pizza crusts or bagels are my favorites. I have been wanting to try their cupcakes but they keep selling out. Would like to try the aged cheddar ancient grain chips! I love the Salted Caramel Cashew Cookies. The granola bars are a favorite of mine. Wholegrain bread all the way! I love the Udi's chocolate chip cookies!! We love all the udis products weve tried, but i have to say pizza crust is our favorite. Easy quick fun dinner helper!